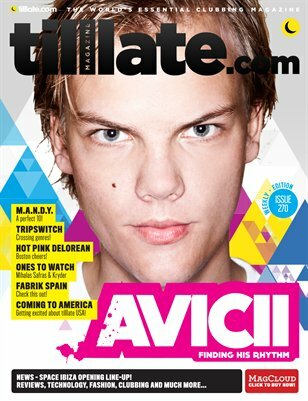 STRICTLY RHYTHM I’m pretty sure when we covered Avicii a while ago with our ’10 things you didn’t know about…’ feature we were the first magazine to feature him. Always being interested in new music from a DJ perspective, his mixes of new and old tunes seemed to be landing in my inbox on a daily basis. Fast-forward to present day and he’s now the award winning, chart topping, DJ/producer sensation… and all of it’s fully deserved. A young guy, loving what he’s doing, and making music for 2011 from old and new beats, exactly what he’s done with the Strictly Rhythm album. It’s great to see a legendary label hand over the reins to someone as young and prolific as Avicii. Well done mate, the future of dance music is in safe hands. In The Mag We catch up with M.A.N.D.Y. on their 10th compilation on Get Physical, Tripswitch, Mihalas Safras, Kryder and from the USA, Hot Pink Delorean. Our clubbing is from Birmingham, Coalville and the simply fantastic Fabrik in Spain. Plus loads more!